Austerity is brutalising the workplace. This is a short video written and produced by Barnet UNISON to expose the impact of bullying in the workplace. Our experiences of representation in the workplace are clear. Bullying is rife. Its everywhere and the hand of Austerity is there for all to see. Year on year of cuts to staff has created a work place which is impossible to deliver. Something has to give, sadly it is often our members health and wellbeing. We made this video for our members with the final message to contact us. 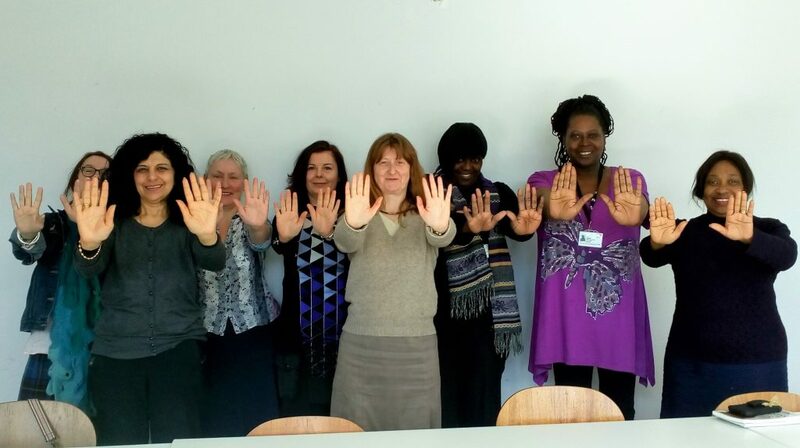 Friday 1 February 2019 was a big day for all cleaners working on the outsourced Barnet Council Corporate Cleaning contract. 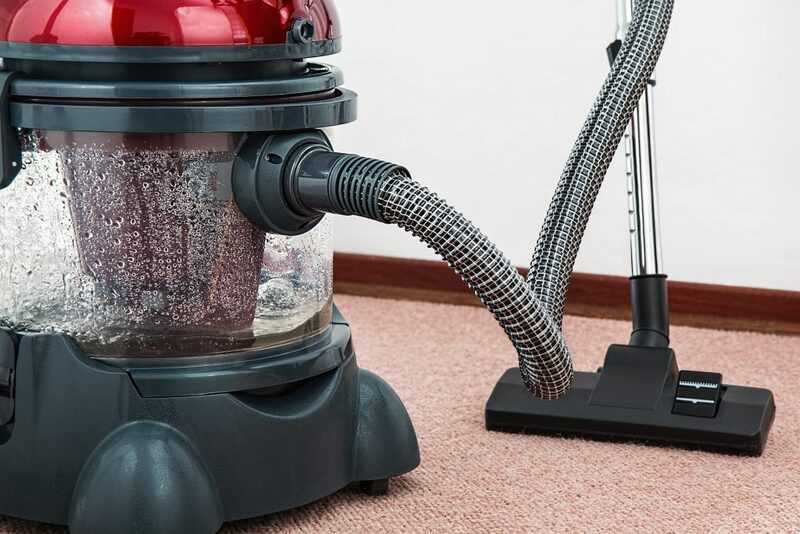 All cleaners working on the Barnet Corporate Cleaning contract moved from £7.83 an hour to £10.55 an hour. After 15 years of lobbying to get them on the London Living Wage it has finally happened. No worker in Barnet Council earns less than LLW and that has been included in the most recent outsourced contracts. On Monday 14 May 2018, Barnet UNISON continued our pledge made at our AGM to send our banner in solidarity to each Grenfell Silent march which take place on the 14th of each month. 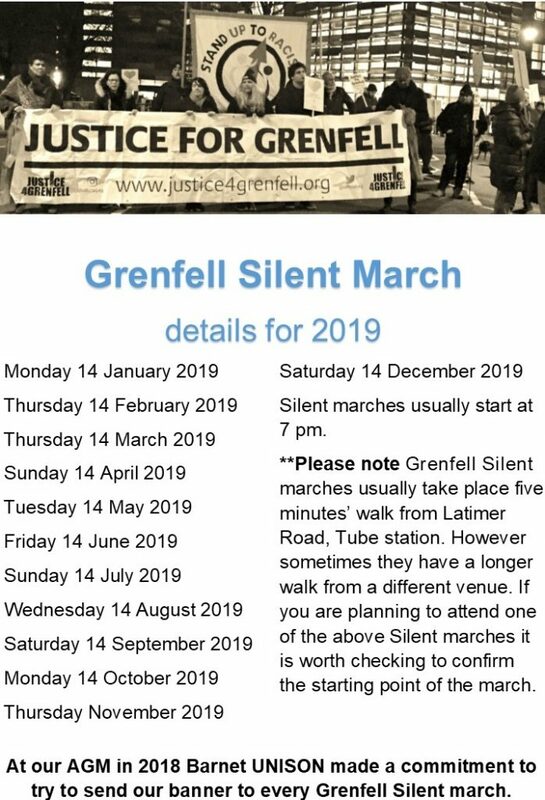 I have been on hundreds of marches but I’ve not attended a silent march before. It is hard to explain just how powerful it is unless you are there. Once it begins no one speaks, no mobile phones, the traffic stops, even the birds in the trees seem subdued. I could hear the wind in the trees, it was so quiet I could hear the Barnet UNISON banner poles squeaking. Half way through the march there is a touching scene where residents shake the hands of the firefighters who are lined up in respect alongside of the march. I spoke to a number of people and they do welcome the unions providing solidarity. This collection of campaigns are having to fight tooth and nail for justice. Whilst they have won a victory to have people on the panel alongside the Judge there is so much to fight for. Today we heard news that the Government won’t ban combustible cladding. That is impossible to comprehend after what has happened at #Grenfell. History tells a story. We know, from #Hillsborough and #Orgreave just how long working class communities have to wait for justice. It’s important that trade unions do what trade unions have been doing for over a hundred years. We offer solidarity in whatever form is acceptable. 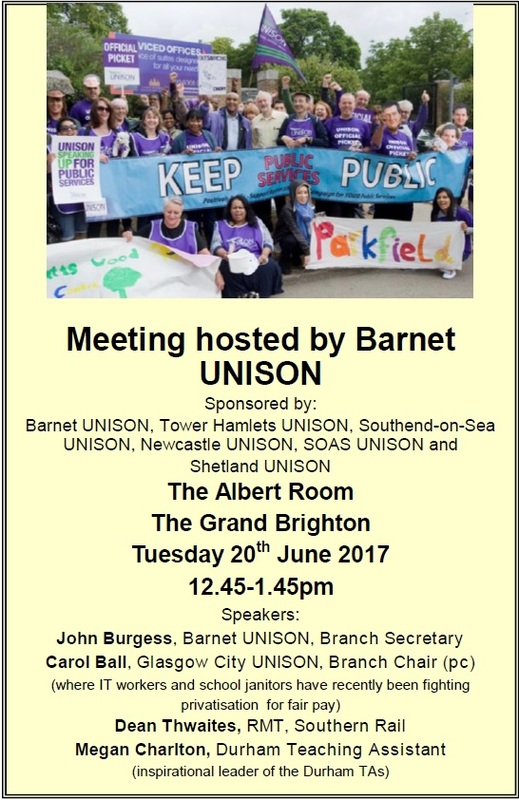 Barnet UNISON will continue to support #Grenfell residents in order they don’t have to wait 20 years for justice. 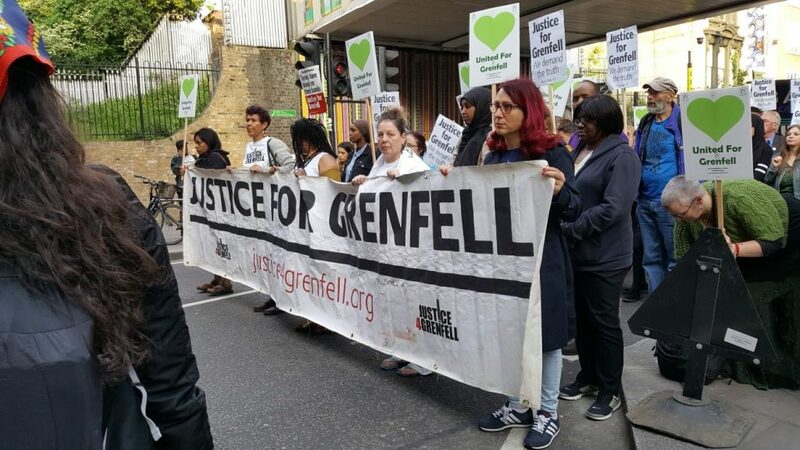 The next #Grenfell Silent march is on Thursday 14 June, 6.30. Jeremy Corbyn on #BarnetCouncil, #Capita and losing control. It is never dull here in Barnet. In the House of Commons yesterday (21 March 2018), Jeremy Corbyn during Prime Minister Question Time, took the opportunity to comment on Barnet Council and Capita and the recent loss of control of the Council as the result of the deselection of 4 Tory Councillors. Its amazing how he finds the time to keep up to date with what is going on in Barnet Council. Happy International Women’s Day! – Move On Up! 101 years ago today women in Russia began taking strike action and this sparked the revolution of 1917. In those times this day was called “International Working Women’s Day”. UNISON is the one union in Britain dominated by a female membership. We should take inspiration from our predecessors. Have you completed your ballot on pay? Today is the last day of the ballot so please have your say and make your voice count. We recommend a rejection of the offer on the basis that the public mood is with us and we believe we can do better than accepting below inflation pay ‘offers’. 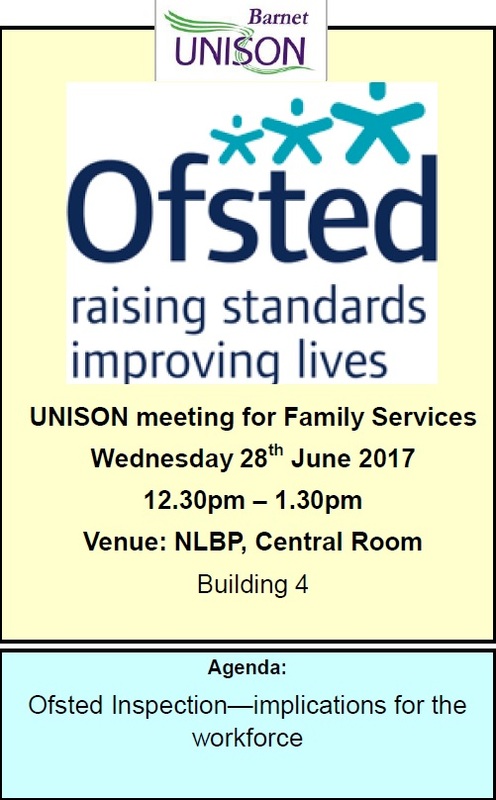 Barnet UNISON wants to offer support and solidarity to all of our members working in Family Services. Please try and attend our next meeting on Wednesday 28 June 12.30 – 1.30, Central Room, Building 4.